Visit Rock Church and Uspenskin Cathedral (Uspenskin Katedraali) for their historical value. 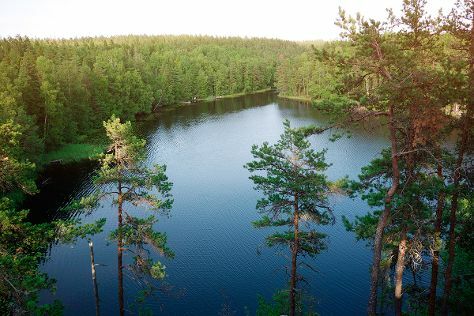 Take a break from the city and head to Nuuksio National Park and Arctic Expedition. Explore Helsinki's surroundings by going to Sipoonkorven Kansallispuisto (in Vantaa) and Kaitalampi (in Espoo). Pack the 26th (Mon) with family-friendly diversions at Linnanmaki Amusement Park. There's still lots to do: brush up on your military savvy at Sea Fortress Suomenlinna, contemplate in the serene atmosphere at Kamppi Chapel of Silence, tour the pleasant surroundings at Hietaranta Beach, and don't miss a visit to Senate Square. For where to stay, maps, photos, and more tourist information, read Helsinki holiday planner . Brussels, Belgium to Helsinki is an approximately 5.5-hour flight. You can also do a combination of train and flight; or drive. Traveling from Brussels to Helsinki, you'll lose 1 hour due to the time zone difference. In August, daytime highs in Helsinki are 24°C, while nighttime lows are 13°C. Wrap up your sightseeing on the 1st (Sun) to allow time to travel back home.